NEW HAVEN, Conn., Dec. 3, 2018 /PRNewswire/ -- Biohaven Pharmaceutical Holding Company Ltd. (NYSE: BHVN) today announced positive topline results from a randomized, controlled Phase 3 clinical trial (BHV3000-303 or Study 303) evaluating the efficacy and safety of its Zydis® orally dissolving tablet (ODT) formulation of rimegepant, an oral calcitonin gene-related peptide (CGRP) receptor antagonist, for the acute treatment of migraine. In Study 303, rimegepant Zydis ODT statistically differentiated from placebo on the two co-primary endpoints as well as the first 21 consecutive primary and secondary outcome measures that were prespecified in hierarchical testing. Consistent with the two previous Phase 3 clinical trials, Study 303 met its co-primary registrational endpoints of pain freedom and freedom from most bothersome symptom (MBS) at 2 hours using a single dose (Table 1). Importantly, patients treated with the rimegepant Zydis ODT formulation began to numerically separate from placebo on pain relief as early as 15 minutes, and this difference was statistically significant at 60 minutes (p < 0.0001) (Figure 1). 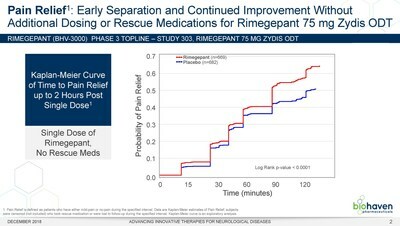 Additionally, a significantly greater percentage of patients treated with rimegepant Zydis ODT returned to normal functioning by 60 minutes as compared to placebo (p = 0.0025). Lasting clinical benefit was observed through 48 hours after a single dose of rimegepant on freedom from pain (p < 0.0001), pain relief (p < 0.0001), freedom from the most bothersome symptom (p = 0.0018), and freedom from functional disability (p < 0.0001). Superiority over placebo was also demonstrated in multiple other secondary endpoints. The vast majority of patients treated with rimegepant Zydis ODT (85%) did not use any rescue medications. The safety and tolerability observations of rimegepant in Study 303 were consistent with the profile previously observed in Studies 301 and 302. Table 2 shows the pooled safety data across all three trials. In study 303, no single adverse event (AE) occurred in the rimegepant group with an incidence higher than 1.6% and overall rates of AEs were similar to placebo. With regard to liver function tests, one patient treated with placebo and one patient treated with rimegepant showed LFTs > 3x ULN in Study 303. Pooled liver function test results across the three pivotal trials (n=3,556) performed to date showed that rimegepant was similar to placebo with regard to aminotransferase (ALT or AST) levels above the upper limit of normal (ULN) and no patients experienced elevations in bilirubin > 2x ULN (Table 3). 1. No other individual AEs ≥ 1% in rimegepant treated subjects than those listed in table. Includes all AEs without attribution to drug relatedness. 2. No drug-related Serious Adverse Events (SAEs). Two of the subjects with SAE in rimegepant group and one in placebo group had not been dosed before onset of SAE. Vlad Coric, M.D., Chief Executive Officer of Biohaven, stated, "Fast-acting and long-lasting pain relief in an easy to use formulation is important to patients. Rimegepant provides these characteristics and we believe is the first oral CGRP receptor antagonist to report superiority over placebo on pain relief and return to normal functioning by 60 minutes. These results, combined with the previous data from the two prior Phase 3 trials, reinforce the potential of rimegepant to be an important new and differentiated option for the acute treatment of migraine." The double-blind, randomized, multicenter, Phase 3 outpatient trial treated 1,375 patients across sites in the United States. Patients were required to have at least a one-year history of migraine (with or without aura), consistent with a diagnosis according to the International Classification of Headache Disorders. 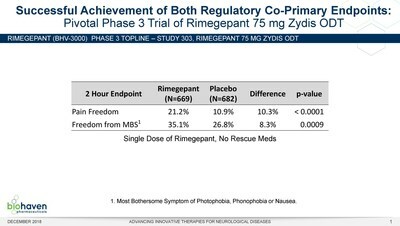 The trial was designed to evaluate the efficacy and safety of rimegepant Zydis ODT formulation compared with placebo in the acute treatment of migraine. Patients were given a single 75 mg dose of rimegepant Zydis ODT or a matching placebo. They were instructed to take their study medication when they had a migraine which reached moderate or severe pain intensity. Richard B. Lipton, M.D., Professor and Vice Chair of Neurology, and Director of the Montefiore Headache Center, at the Albert Einstein College of Medicine stated, "Migraine is a serious, incapacitating, and highly prevalent neurological disease affecting 15% of the population. People with migraine miss work and lose time with their families because of disabling pain and associated symptoms. The most widely used acute prescription drugs, triptans, have cardiovascular contraindications, do not work in everyone and have been associated with high recurrence rates in those who respond. Rimegepant Zydis ODT formulation is rapidly absorbed and has a long half-life. It is gratifying to see the attractive pharmacokinetic profile deliver on its promise in a randomized trial. If approved, rimegepant could potentially play an important role in helping people with migraine find relief from their pain and get back to what they need to do in their lives." Biohaven has an exclusive worldwide license agreement with Catalent U.K. Swindon Zydis Limited, a subsidiary of Catalent, Inc. (NYSE: CTLT) ("Catalent") to provide Catalent's Zydis ODT formulation for the development of rimegepant. The agreement also provides exclusive rights for developing small molecule CGRP receptor antagonists with the Zydis ODT technology. Catalent's proprietary Zydis ODT fast-dissolve formulation is a unique, freeze-dried, oral solid dosage form that dissolves rapidly in the mouth, without the need for water. With more than 20 products launched in 50 countries and a dispersion speed of three seconds or less, Zydis ODT is generally recognized as the world's fastest and best-in-class orally dissolving tablet. Zydis is a registered trademark of R. P. Scherer Technologies, Inc.
Robert Croop, M.D., Chief Development Officer – Neurology at Biohaven commented, "We are very pleased with the performance of our novel rimegepant Zydis ODT and believe that this formulation enhances the benefits offered by rimegepant and heightens its potential to become a best-in-class agent for the acute treatment of migraine. The rimegepant Zydis ODT was designed to enable patients to experience relief wherever and whenever a migraine strikes. The results of Study 303 demonstrate the clinical utility of this novel formulation." Additional secondary and exploratory outcome measures from this study are anticipated to be presented at upcoming scientific meetings in 2019. Biohaven will host a conference call and webcast today, December 3, 2018, at 8:30 a.m. ET (5:30 a.m. PT) to discuss topline results from the Phase 3 clinical trial of Rimegepant Zydis Orally Dissolving Tablet (ODT). The call can be accessed by dialing 877-407-9120 (domestic) or 412-902-1009 (international). To access the audio webcast with slides, please visit the "Events & Presentations" page in the Investors section of the Company's website at https://www.biohavenpharma.com/investors/news-events/events-presentations. An archive of today's teleconference and webcast will be available on Biohaven's website for 6 months following the call. Migraine is both a widespread and disabling neurological disorder. The Migraine Research Foundation ranks migraine as the world's third most prevalent illness, affecting approximately 36 million people or 1 out of 4 households in the United States. And the Global Burden of Disease Study 2015 rates migraine as the seventh highest specific cause of disability worldwide. More than 90% of people with migraine are unable to work or function normally during an attack. Current treatment approaches, such as triptans, can be limited by headache recurrence within 24 hours after taking migraine medication, as well as cardiovascular contraindications and warnings. Rimegepant (formerly known as BHV-3000), Biohaven's lead product candidate, is an orally available, selective and potent small molecule CGRP receptor antagonist. The company believes rimegepant has the potential to be a best-in-class CGRP receptor antagonist for the acute and preventive treatment of migraine with the ability to address important unmet needs. The efficacy and safety profile of rimegepant has been consistently established across four randomized controlled trials, now including three Phase 3 studies (ClinicalTrials.gov Identifiers: NCT03235479 (Study 301); NCT03237845 (Study 302), NCT03461757 (Study 303)) and a Phase 2b study (NCT01430442). The co-primary endpoints achieved in the Phase 3 trials are consistent with regulatory guidance from the U.S. Food and Drug Administration (FDA) and provide the basis for a planned submission of a new drug application (NDA) to the FDA in 2019. This news release includes forward-looking statements within the meaning of the Private Securities Litigation Reform Act of 1995. These forward-looking statements involve substantial risks and uncertainties, including statements that are based on the current expectations and assumptions of the Company's management. All statements, other than statements of historical facts, included in this press release, including the Company's timing of the expected NDA submission for rimegepant and its potential to be an improved treatment option for the acute treatment of migraine, are forward-looking statements. The use of certain words, including "believe" and "will" and similar expressions, is intended to identify forward-looking statements. The Company may not actually achieve the plans and objectives disclosed in the forward-looking statements, and you should not place undue reliance on the Company's forward-looking statements. Various important factors could cause actual results or events to differ materially from those that may be expressed or implied by our forward-looking statements, including that topline data is based on preliminary analysis of key efficacy and safety data, and such data could change following a more comprehensive review and evaluation of more extensive data from the trials that the Company has not yet received, and these preliminary conclusions may not accurately reflect the complete results of the clinical trials, and uncertainties relating to the timing for submitting an NDA and the potential regulatory approval of rimegepant. Additional important factors to be considered in connection with forward-looking statements are described in the "Risk Factors" section of the Company's Quarterly Report on Form 10-Q filed with the Securities and Exchange Commission on November 14, 2018 and other filings Biohaven makes with the U.S. Securities and Exchange Commission from time to time. The forward-looking statements are made as of this date and the Company does not undertake any obligation to update any forward-looking statements, whether as a result of new information, future events or otherwise, except as required by law.